1. Kielh’s Olive Fruit Oil Nourishing Conditioner – It contains Olive and Avocado oils and is meant for Dry, Damaged and Under-Nourished hair, This is an amazing product and you must try it out. It controls frizz, adds shine and leaves hair super soft as well as smelling wonderful. My friend who recommended the product to me told me that her boyfriend really liked the smell of it so that is probably an additional reason for you to give this baby a shot 😉 Drop by the Kiehl’s store and pick up a sample of it. A lot of people commented on my hair in my OOTD – Shades Of Purple And Grey post and I had used this conditioner back then. This will give you movie star like hair…like seriously! Undoubtedly on my repurchase list. Price is Rs. 1290/- for 200 ml. 2. 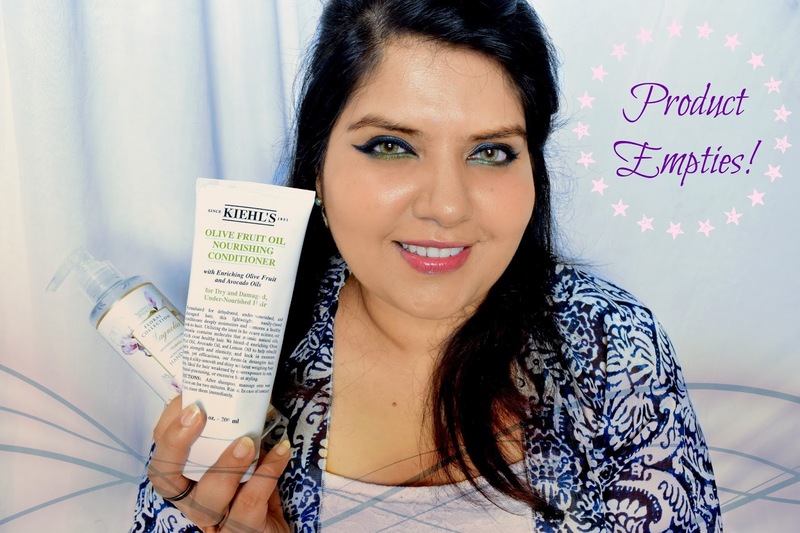 Kiehl’s Calendula Herbal Extract Toner – This is an alcohol free toner and ideal for people who have issues with it. 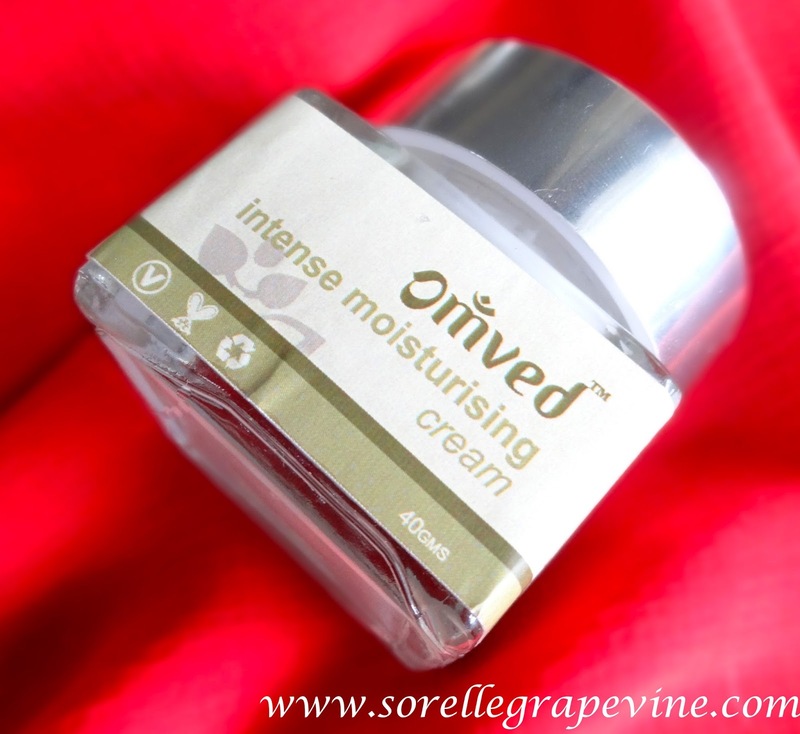 It is quite gentle on the skin. For me, this was ok and didn’t do much ie didn’t keep my pimples or rash at bay or anything. It was just a toner ie a part of my routine. 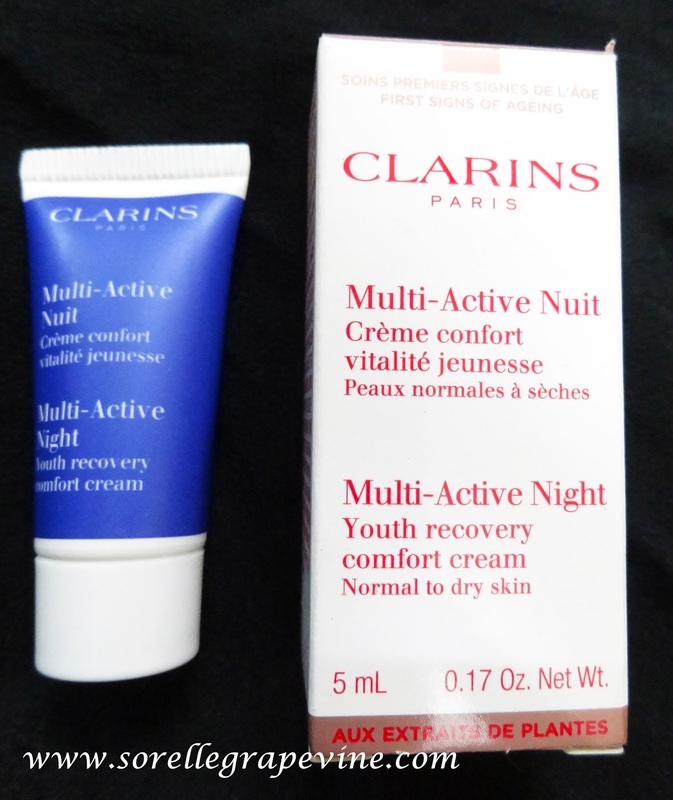 Till date I still prefer the Clinique one coz that made my skin behave and I don’t have sensitivity to alcohol. This is quite pricey and I had bought it at Rs. 2500/- for 250 ml. Having said that it lasted me for almost 2 years so it becomes cost effective in that manner. But I will not repurchase this as I would prefer that my toner gives me some additional benefit rather than the basic purpose it is meant for.3. Label M Dry Shampoo – I have a detailed review for this which you can read here. Oh incidentally I had paid Rs 720/- for it and not 900 like I mentioned in the vid. Even though I didn’t like it I still stuck to it coz I wanted to get over it with it somehow. And I would have to go to town with it aka spray it on like there was no tomorrow and then tie my hair up to sort of add to the disguise further. And towards the end it got worse where the particles being visible in my hair thing happened. So no I don’t like it, would not repurchase it and don’t recommend it. 4. 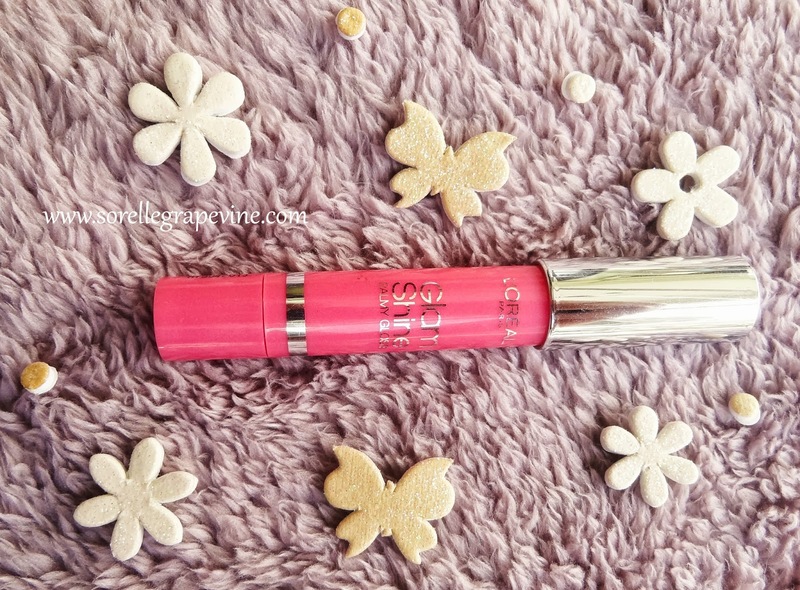 L’Oreal Volume Million Lashes Mascara – Like I mention in the vid this is my current HG mascara and on my repurchase-for-life list. So far nothing has beaten this for me in the results it gives. I am yet to try some of the talked about International brands but given how easily this is available I will still be leaning towards this for now. I prefer to pick the water resistant version as my eyes are very sensitive to water proof formulations. 5. M&S Magnolia Hand Wash – This is a moisture rich hand wash part of their floral collection. Ok usually soaps which are supposed to be SLS free tend not to lather well but that is not the case with this as it does contain SLS in it. 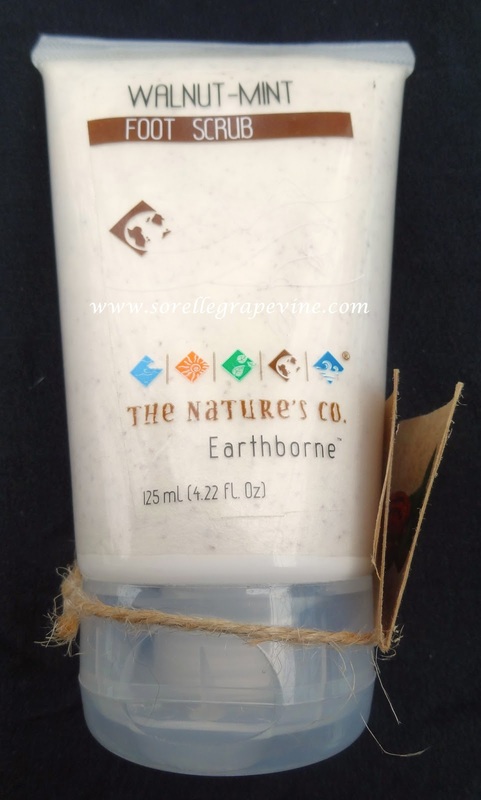 It does smell really nice and does not dry out your hands but I feel that it is lacking as a soap since a) it does not lather well unless you use a lot of it and b) it is pricey in that manner as it gets over too fast. This costs Rs. 199/- for 200ml and I feel that it is more of a decorative kind of thing rather than a practical use product. The China Blue variant of it is still better as it lathers well even in a little quantity. But still I doubt if I will ever repurchase any handwash from this brand. 6. Indola Innova Specialist Dandruff Shampoo – This is really really good and it is very hard to find now that Slassy does not stock it anymore. I hope some other Indian website picks this up soon. It is extremely effective in any kind of dandruff situation I had going on. Sometimes during summers things would get really bad and I would get major itching on my scalp but ever since I have been using this product I have forgotten all about any past dandruff issues. It is very gentle on the hair and does not coz damage like how a lot of the effective medicated ones do. I would advise you to use it like I do ie as a treatment shampoo. I first wash the dirt and grime from my hair with a regular shampoo and then I take little of a treatment shampoo and apply it to my scalp. I then let it remain there for a few minutes while I go wash and scrub my face. After that I wash the shampoo out and apply my conditioner. This way it gets to work on a clean scalp and even get a couple on minutes to seep in. I paid Rs. 120/- for 100ml of product. Do try it out if you can lay your hands on it. I spotted these at an online shopping site and they just had 3 colors in it. On an impulse I got all 3 as I have gained a fondness for this format of product in recent times and have found some of my favorites in them. All the names have a fruit element to it – Lychee Lust, Peach Pleasure and Passion Fruit Perfect. They stand about 3 inches tall where the entire body is the color of the product (not a close match) and has a metal finish cap. Their base can be twisted to dispense more product. 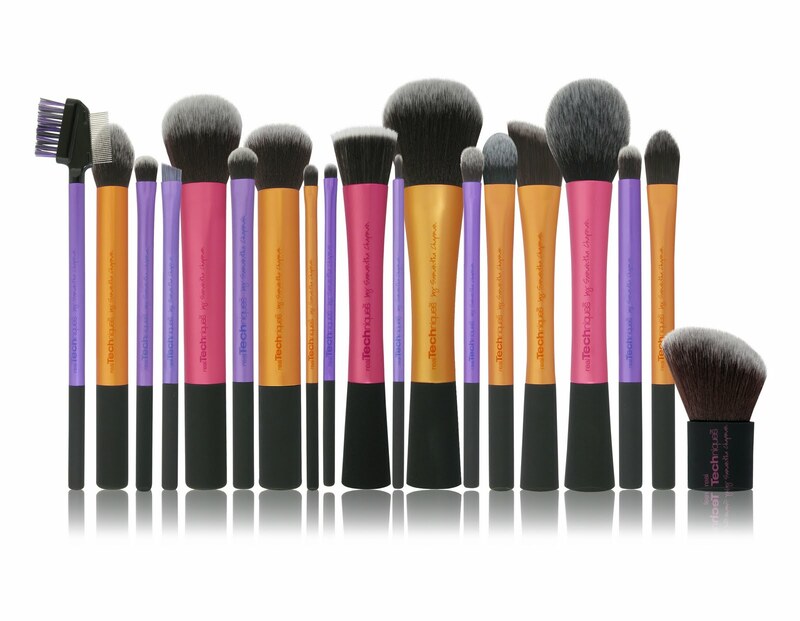 All the colors have a soft pigmentation and contain shimmer it. I feel that the shimmer quantity should have been a little more and the size should have been a little more finely milled. 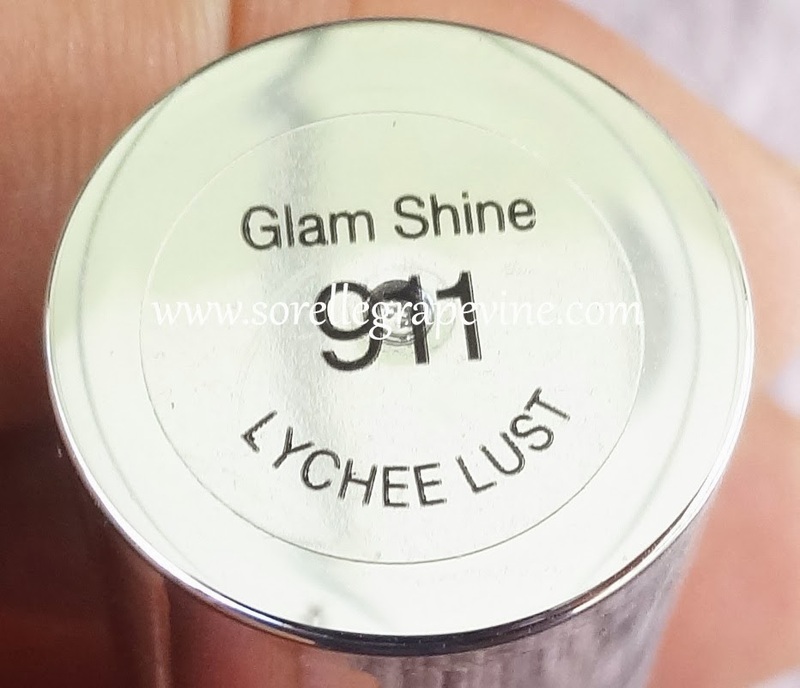 No I have not lost my head 😛 Let me tell you why….the purpose of adding the shimmer is to create a dimension but it some how falls short here and when you have the product on you will observe random twinkles of shimmer. So they are not doing anything much in particular. That was the reason for my suggestion as in that manner there would have been actual depth in the color. It is not as bad as it sounds and you can still pull off some of the colors in daily wear. What I really like about them is their texture. They are a proper balm for the lips minus any strong scent or flavors. The product feels real comfortable on so much so that you forget that there is something on your lips. But minus the stain part they go off quite fast. By the 3rd kiss your lips are left devoid of color but a covering of the glitter remains. Yes I can hear the glitter haters groaning 🙂 So those were the basic qualities which form the base for the colors. Lets look at the shades individually now. I was the most excited about this coz of its name as it is my favorite fruit but have been most disappointed by the color. 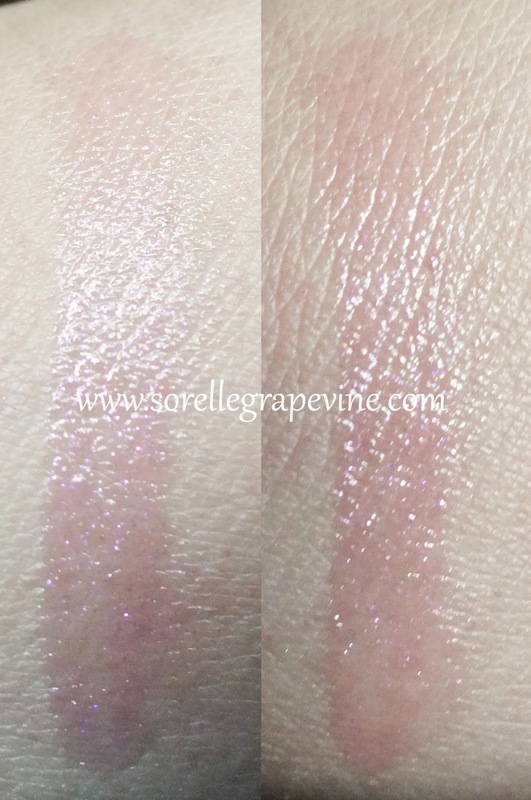 In the hand swatch, it is the sheerest of pink with light purple glitter in it. I have pigmented lips so on me this looks like a covering of glitter. I cant make out the sheer shade one bit. If you have naturally rosy lips then you can look into it otherwise honestly I will ask you not to waste your money on this and look into the other shades that are available. It is just a glitter balm (?!?). L’Oreal has a penchant for strange names where the colors and names don’t match for some odd reason. Case in point, this is no where near a peach shade but rather is a light pink. Now if there are pink peaches somewhere I admit I’m completely ignorant about that fact 😛 This shows as several shades darker pink with purple glitter when compared to the Lychee shade in the hand swatch. 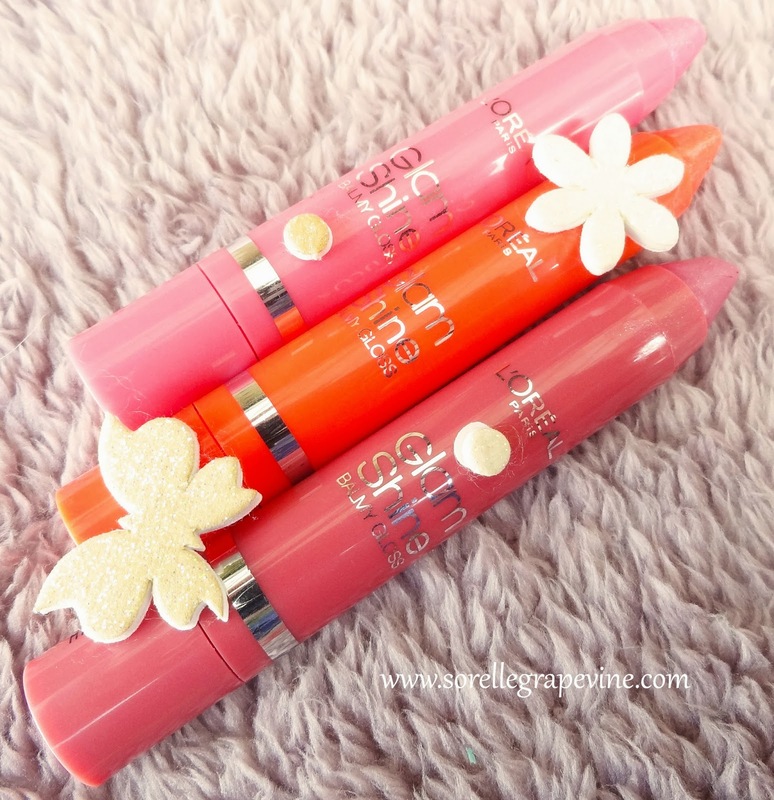 On my lips it imparts a light wash of color giving them a healthy pink looking tinge. By no means it covers my pigmentation but looks a lot better than the Lychee one. This one is my favorite from the lot. As you have seen that I get drawn to the orange and coral shades these days. 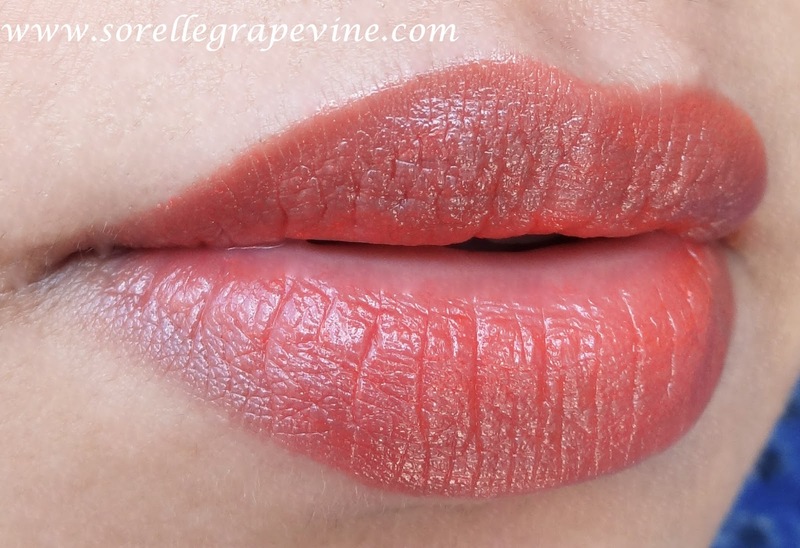 This is a soft orange shade with gold shimmer in it. 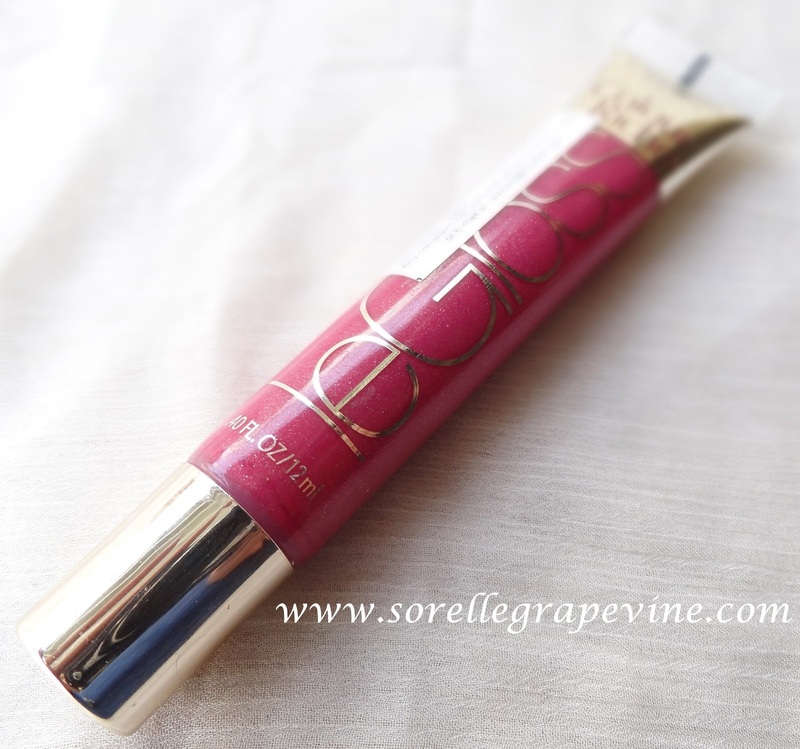 It does not have an intense pigmentation but has enough to cover my lips so the discoloration cant be seen. Really love the softness that it provides to the look and a sure winner for day wear. 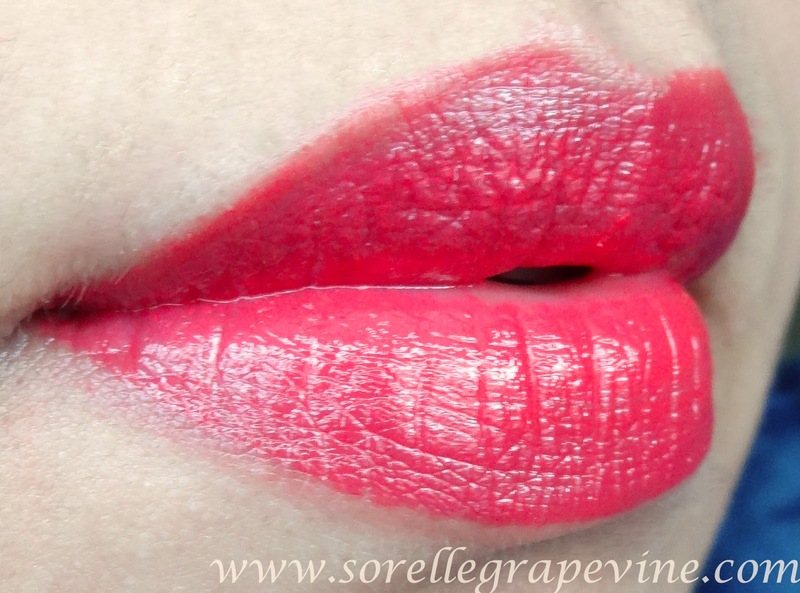 Even the person who is most afraid of sporting an orange lip will be at ease trying this one out. I will definitely recommend that you swatch/pick this one. All pics taken in natural light. 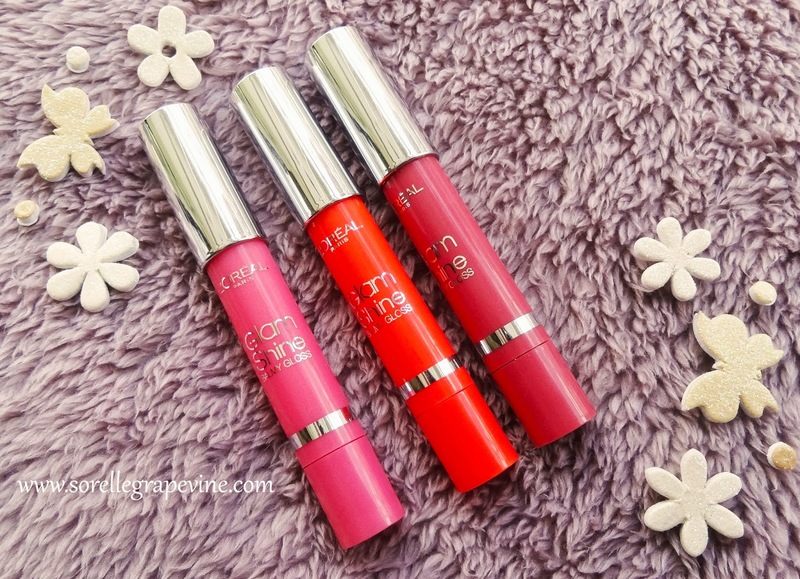 2nd one from top is Lychee Lust, next is Peach Pleasure and last one is Passion Fruit Perfect. 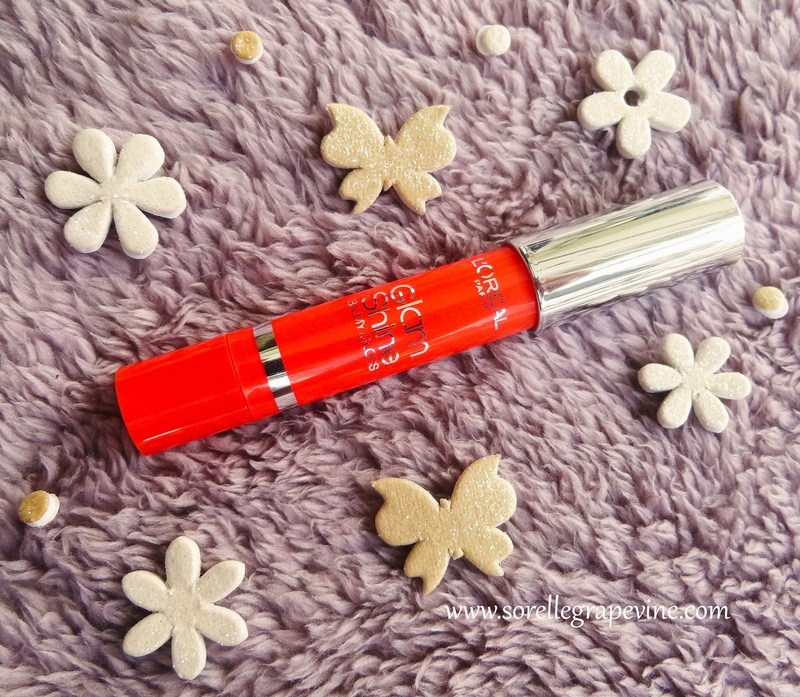 Would you purchase L’Oreal Glam Shine Balmy Glosses again? – Probably the Passion fruit one. 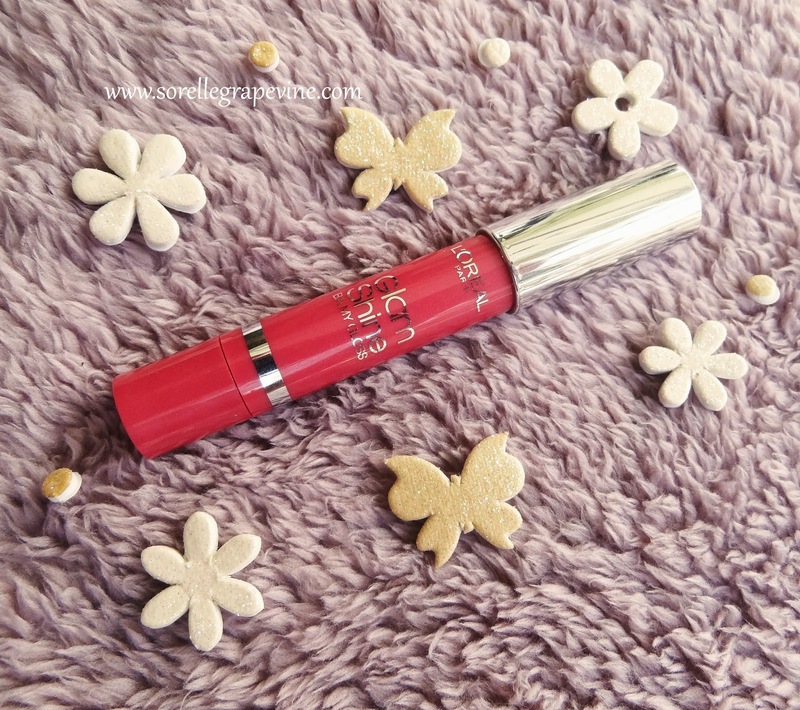 Would you recommend L’Oreal Glam Shine Balmy Glosses to your friends? – Yes some of the colors. Source: rijah.dk. Click pic to enlarge. 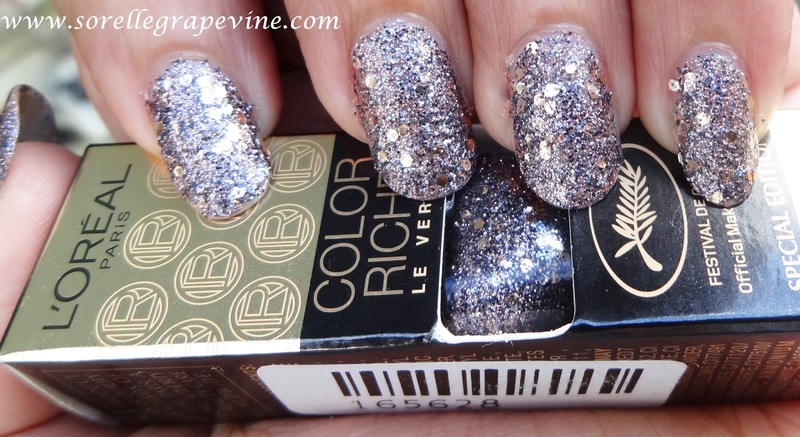 Today I present to you something very interesting that I spotted on the International blogsphere – L’Oreal Color Riche Nails a Porter. What are these? – They are a set of false nails. What is so exciting about them? – Well for a start they are supposed to be soft and flexible thus bending easily with the actual nail so that they don’t feel alien. They are supposed to have a rubbery feel to them. Before I mention the most exciting thing that I found about them let me take you into a little flashback of sorts. I first remember encountering false nails somewhere in the early nineties where you would get them in a set of white slightly translucent color. Packed in a transparent plastic these came with a small glue tube and were all the rage back then. But they were quite stiff and would pop off due to the slightest pressure. You just had to drape your hands and sit tight and not do anything. Flash forward to a couple months back. Having grown tired of false nails long back especially coz of their staying power I was so totally over them. But in the quest of blogging and finding new things I came across them once again and this time it was from Faces. Black with gold metallic tips caught my fancy and I fell hook-line and sinker for it. Applied them and they felt sturdy…..translation lasted 10 mins of work which in my case meant typing on the keyboard. Out it popped and with a sigh I tried to remove the others and honestly had a tough time with it. After literally yanking them off I almost screamed when I saw my nail. The glue had ruined it and it looked how your skin looks if you get some Fevikwik on it! That is a horror story for another time but thankfully they sorted themselves out after couple of days (I think there might have been a mani involved). Source: thesundaygirl.com. Click pic to enlarge. So when I saw what was provided with these new ones it was like heaven sent! 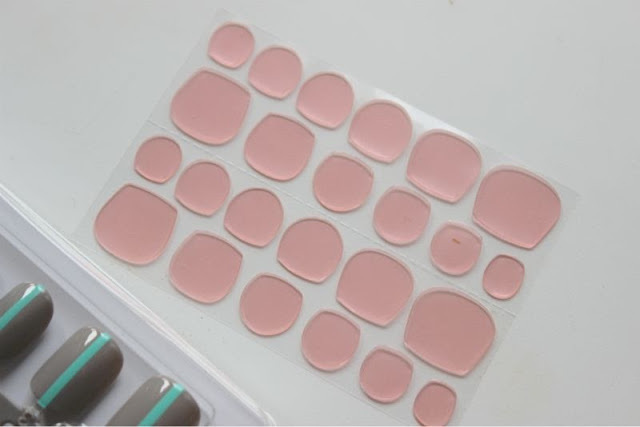 As you can see in the pic above they have given soft gel pads which help the nails to adhere. Is that not a fab idea?!? L’Oreal claims that they will last for about 5 days. But whatever it is I find this a really great idea. Though I’m left wondering how long they will last on someone but the entire concept that they have introduced of the experience being comfortable is like….like….a pair of glamorous heels with a padded comfy sole to it! There are about 8 different designs in it and a set of 12 nails costs around 7.99 pounds (approx Rs. 753/-) which I feel is decent. Would you be interested in getting these? I know I would like to see them make it to our shores and would be picking one set in it at least. Loving the concept behind them! How about you? It is nice to be back 🙂 Work was very hectic and a pain-in-the-a$$! Lot of tension flying back and forth that by the end of the day I was in no mood to pen down basic words. Spent my time watching some very interesting TV series and reading some good books to relax. Now after a nice “detox” session I’m back to the blogging grind. 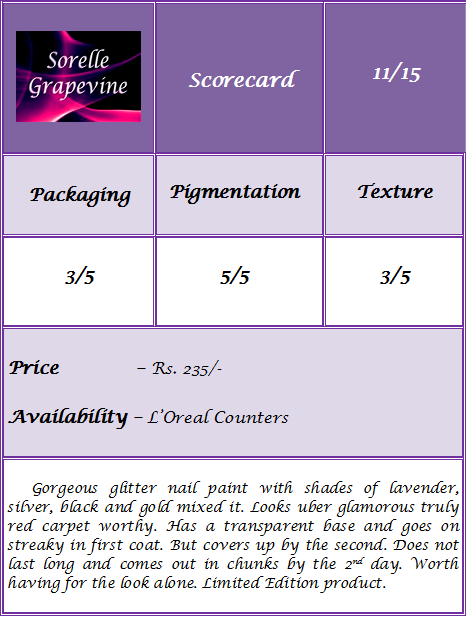 I dug through my to-be-reviewed stash and found one of the nail paints that I had bought from the L’Oreal Cannes Collection. 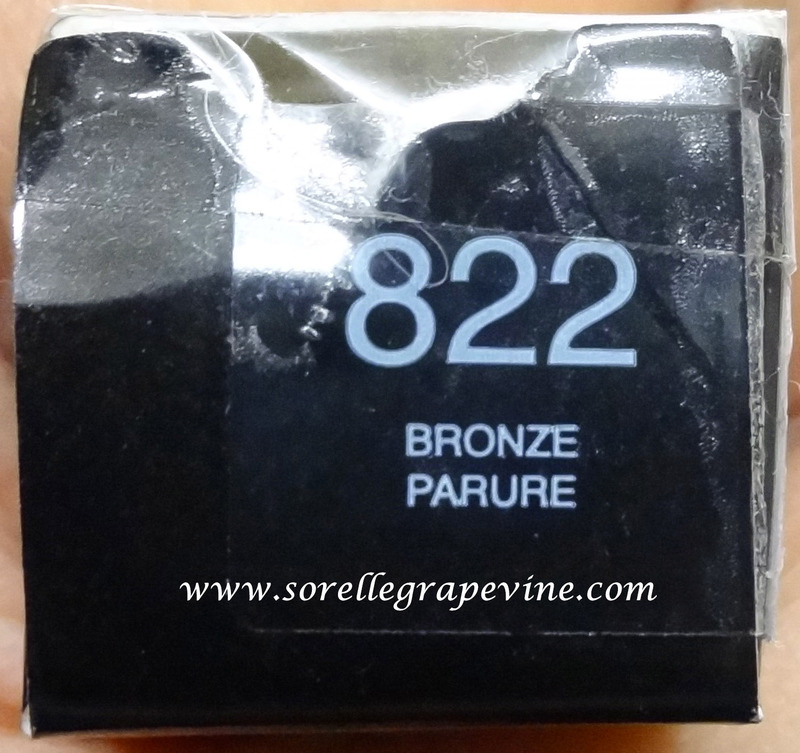 A shade called Bronze Parure. 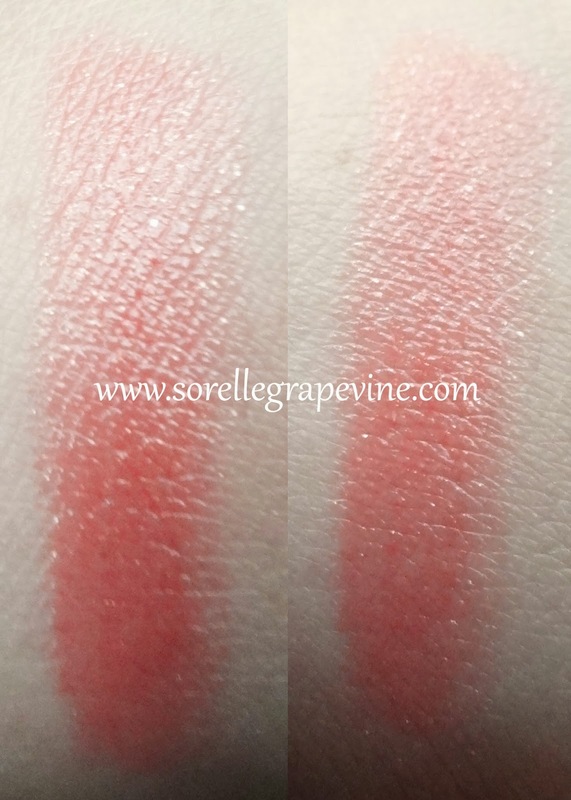 Since the packing is exactly the same as the other two shades that I have reviewed so far – Flaming Sunset & L’Or Amethyst, I will not go down that road (if you want to read about that detail then click of any of the shade names). But what I do want to point out is that though the brush is same as before, big and clumsy, it was not much of a problem here. Now let me just jump right into the color and texture of the thing. I will admit that I’m in love with this one. I liked it much more than the other two that I have talked about earlier. This is just a class apart for me and what is actually an uber glamorous shade something that I can imagine wearing while walking down the red carpet. The shade is quite unusual and looks different under various lights. Unlike the others this has a transparent nail paint base. There are dual sized glitter in it – fine and chunky round ones. 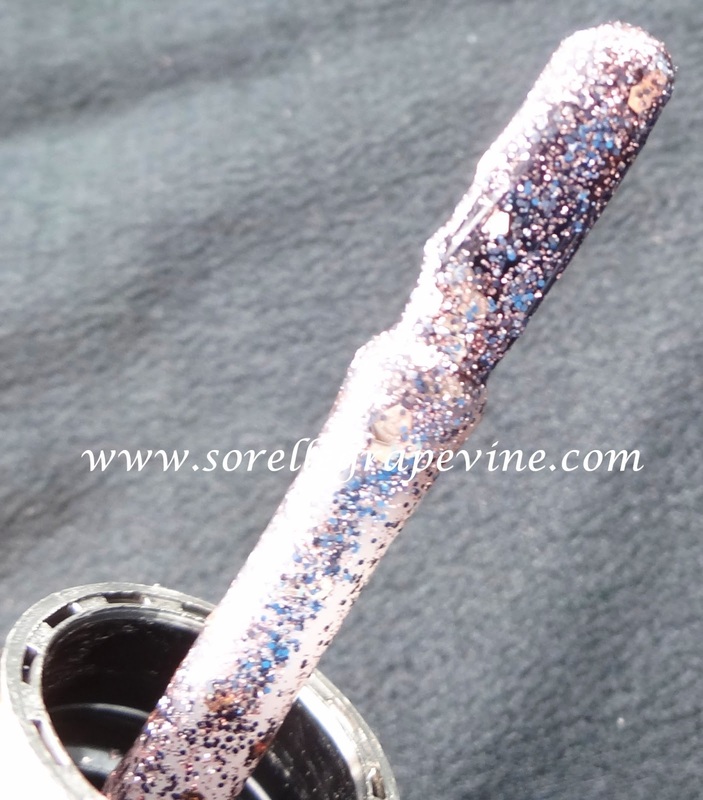 Fine glitter is made up of lavender, silver and black particles from what I can make out. 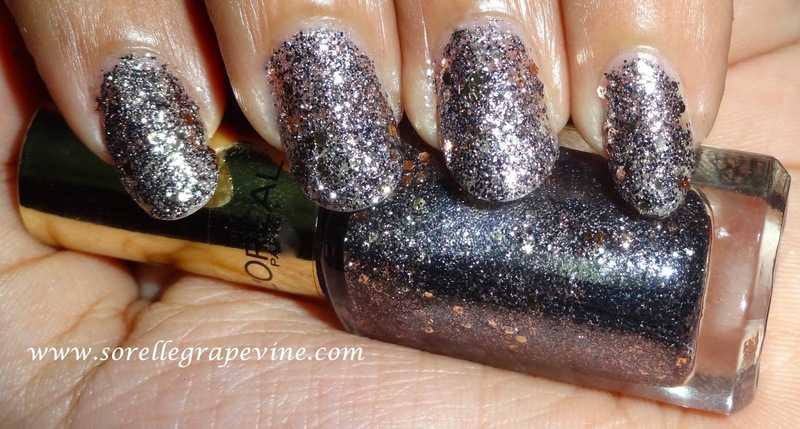 The chunky glitter is pale gold in color. In certain light the purple shade can be made out and in another light the silver and black tones becomes more prominent. 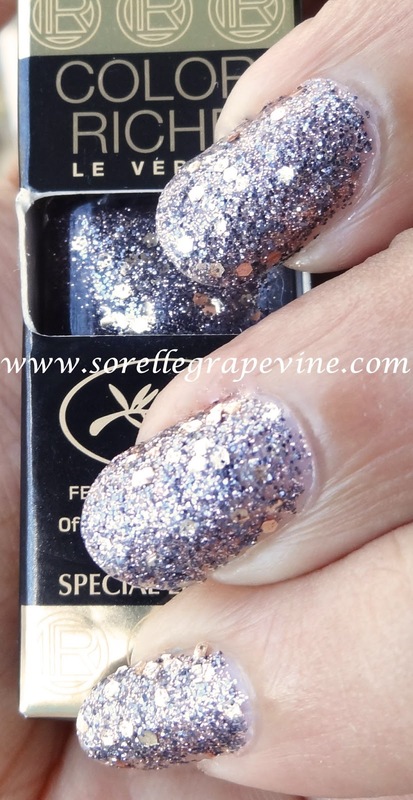 Being a majorly glitter based paint this goes on streaky on the nails. What I had to do was put on one coat and let it be. Trying to cover/pat on the patches caused more of the paint to lift off. However when I let it be and then put on a second coat I got an even coverage and then when I had to pat it on to cover up the paint did not lift from the exiting areas. I got proper coverage in two coats. The top feels gritty and to smooth it a bit I applied a transparent top coat. It helped some what but what it actually did (and I liked) was to add an extra shine to the look. Honestly I could not help but stare at it. Totally up my alley. But like all great romances this too comes to a screeching halt! Chips out in chunks by the second day 🙁 (Waah!). Sigh then comes the painful part of removing it 😛 But it was fun while it lasted and given how this looks I don’t mind anything. Definitely worth picking if you like glitter paints. The color of it is so versatile that it will go with all your outfits. I still have one more to go from this collection. Let’s see how that one works out for me. Did you like this shade? Would you get his for yourself or is it too bling for you? As always I’m eager to hear from you. See you soon! 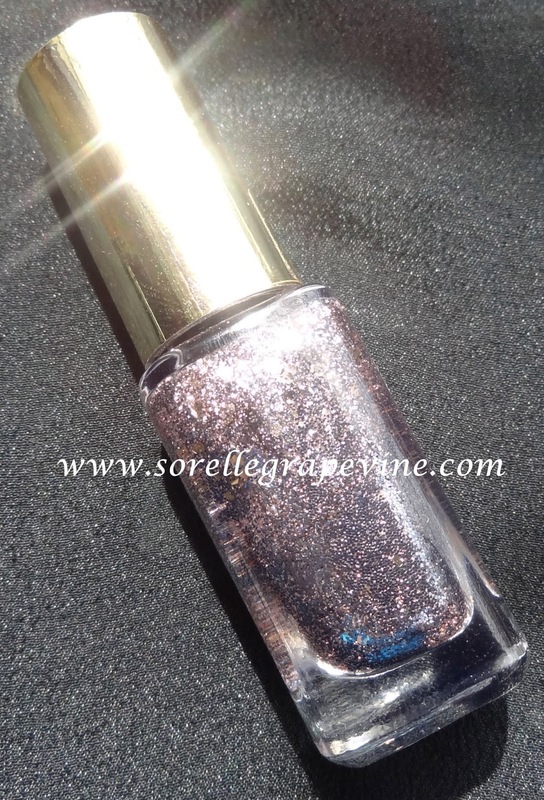 Would you purchase L’Oreal Color Riche Nail Paint Bronze Parure again? – It is a LE item but yes I would purchase it again. 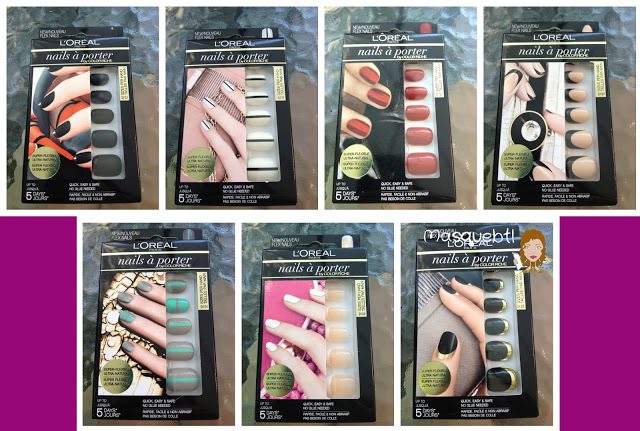 Would you recommend L’Oreal Color Riche Nail Paint Bronze Parure to your friend? – Yes! Hey there! Back again with another nail paint from the L’Oreal Limited Edition collection for Cannes Film Festival. 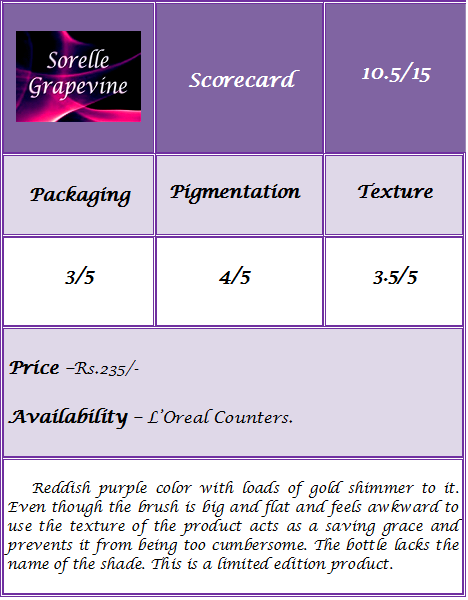 Today I present to you the L’or Amethyst color. One of the few that I have from the collection for which I feel they got the name right unlike the others. This one does actually have shades of purple gracing it. Getting to the basics – the bottle is made of transparent glass topped off with a gold metallic cap. The whole thing is about a little less than 2 inches. 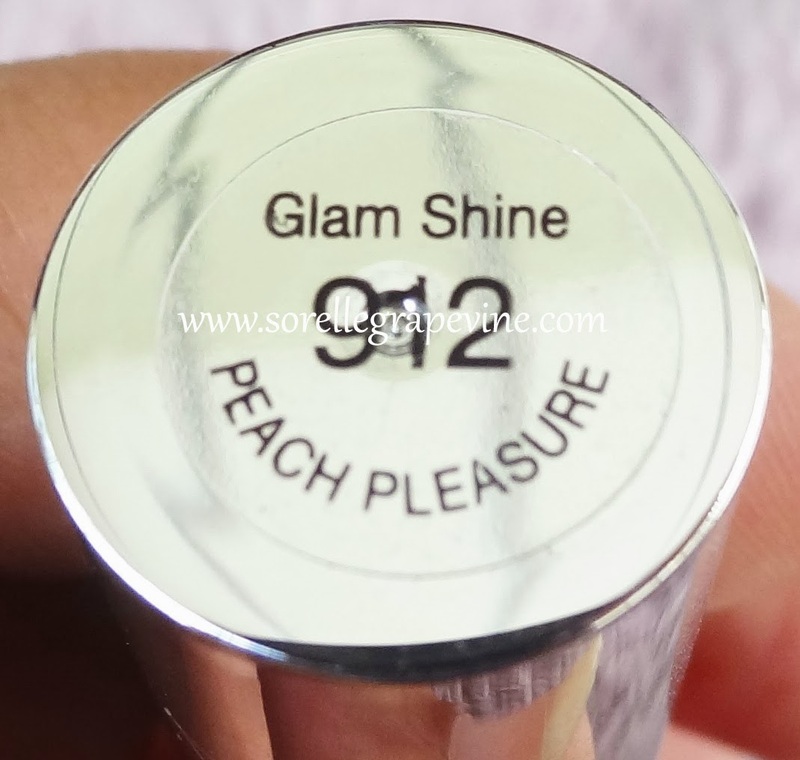 The bottle has a sticker of the company’s name on the cap and the shade number present on the top of the cap and as before the shade name is missing. The brush is flat and big. Seems to be a signature for this product line. In my previous post regarding Flaming Sunset I found the application cumbersome due to the size of the thing but I think the texture of the nail paint was a contributing factor to it. This one still felt a little weird but application was not as much of a pain as the previous one. The formulation is much better than the flaming sunset as this one glides on to the nails decently. 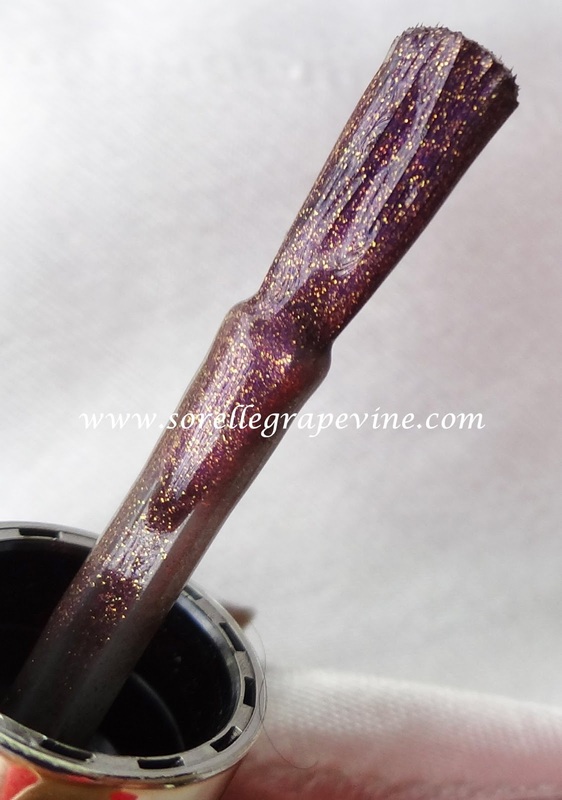 The color is a slightly red tone purple shade with a lot of gold shimmer in it. The particles are minute and add a very pretty effect to the whole thing. Since there is an absence of chunkiness this one is a whole lot easier to get off. 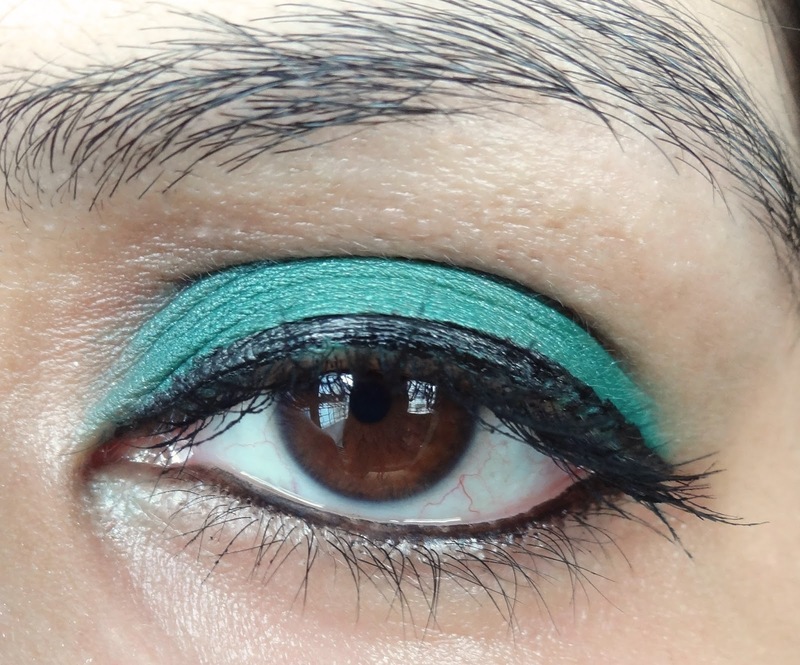 The pigmentation is quite intense and 2 coats give a nice even coverage. 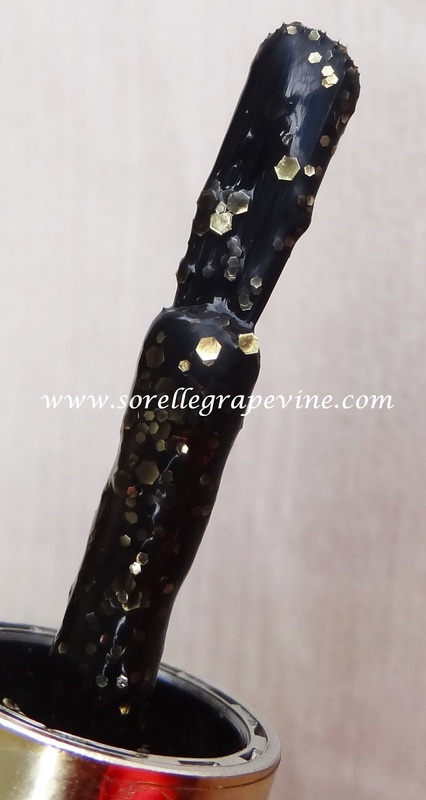 I got some fraying on my tips by the 3rd day and enough chipping by the 5th day that I had to change the paint. In terms of quality and performance this one I like better than the other. Price is Rs. 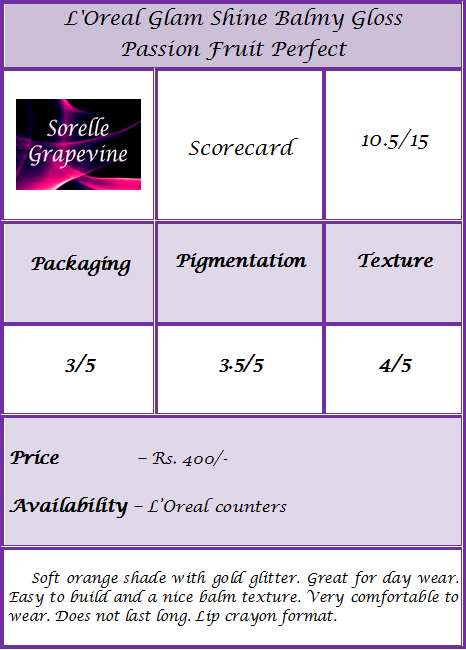 235/- for 5 ml of product. 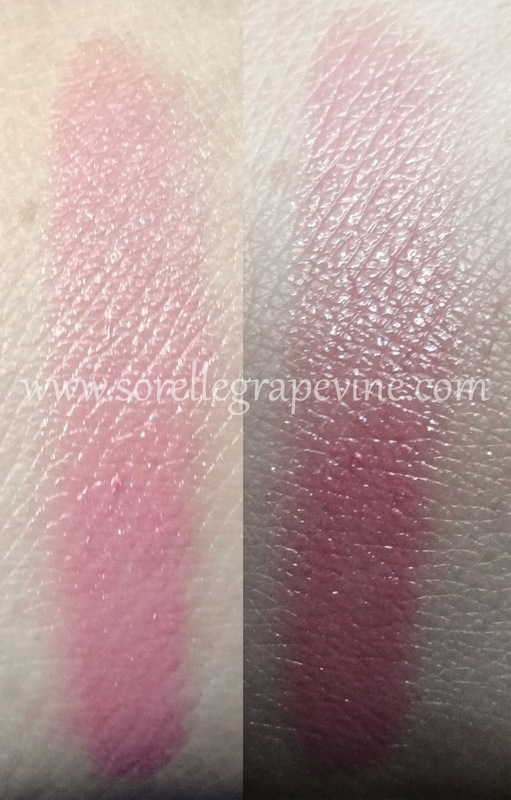 I still have 2 other shades to review from this range. What do guys think about this color? Have you bought any from this range? Do let me know your thoughts and comments. Look forward to it. Catch you later! 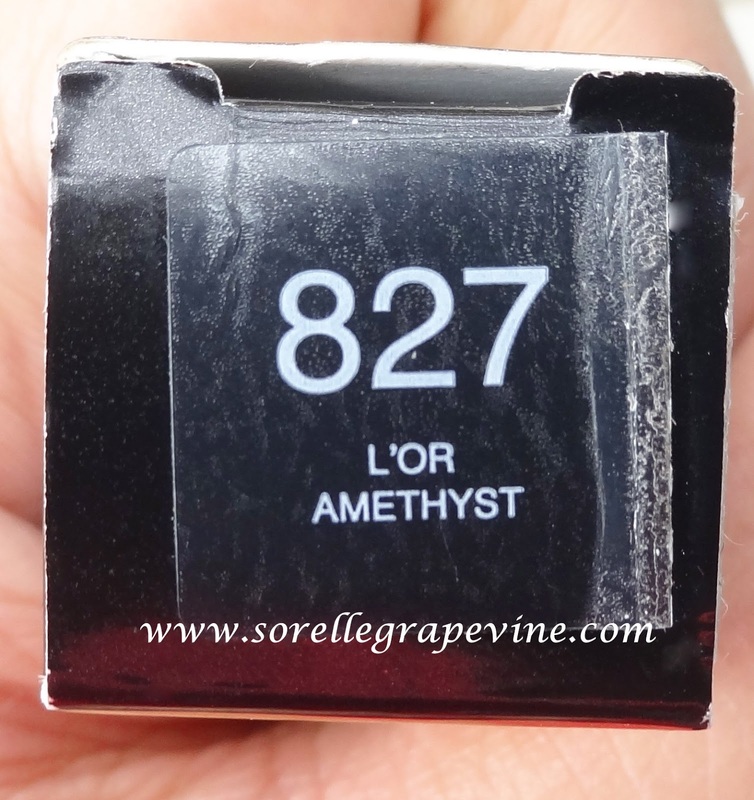 Would you purchase L’Oreal Color Riche Le Vernis Nail Paint 827 L’or Amethyst again? – It is a LE product. The color is nice and I would not mind buying it again. 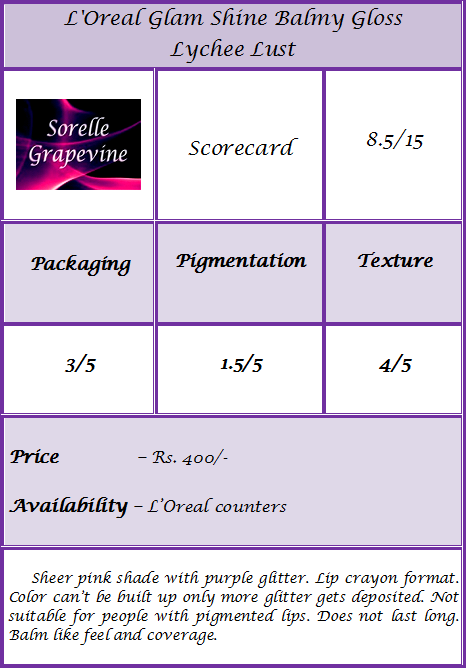 Would you recommend L’Oreal Color Riche Le Vernis Nail Paint 827 L’or Amethyst to your friend? – Yes. There is a lot of buzz about these paints in the blogsphere. 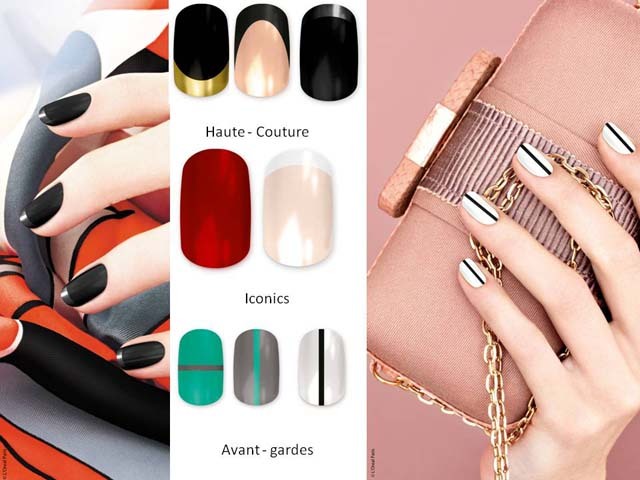 Launched as a limited edition focused on the Cannes Film Festival these nail paints bring in the glitz and the glamour of the film world into our homes. Love em hate em but you just cant ignore em. Hey who would want to ignore something that look so pretty. Even though I really don’t like the whole taking out the glitter polish part but I could not help myself from getting 4 of these. Today I’m going to talk about my experience with Flaming Sunset. 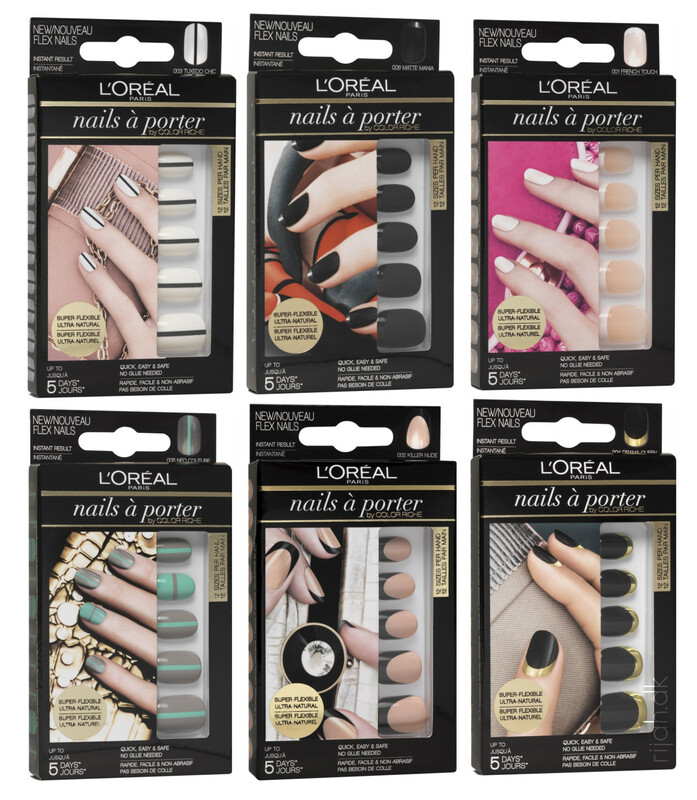 I cant recall a time when I bought a L’Oreal nail paint in my life. I might have but I seriously don’t remember. So I’m going on a limb here and say that this is my first (???) experience with them. I’m no nail paint expert or anything but I’m just gonna go with what I saw and felt. Firstly let me just break down a basic description for you. Comes in a narrow transparent glass bottle with a metallic gold cap. 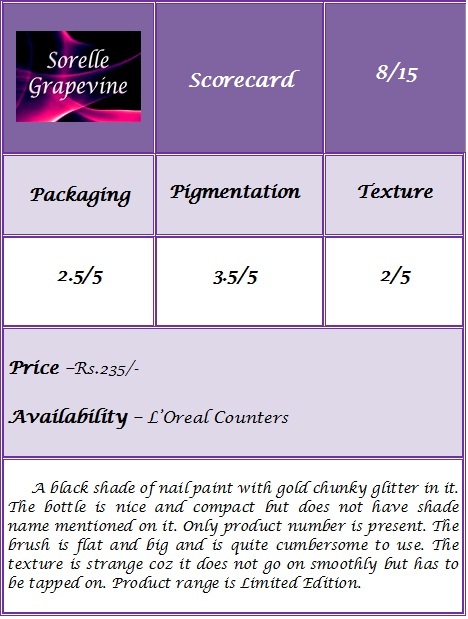 There is nothing printed on the bottle but the cap has the number of the shade and a sticker of L’Oreal’s name on it. 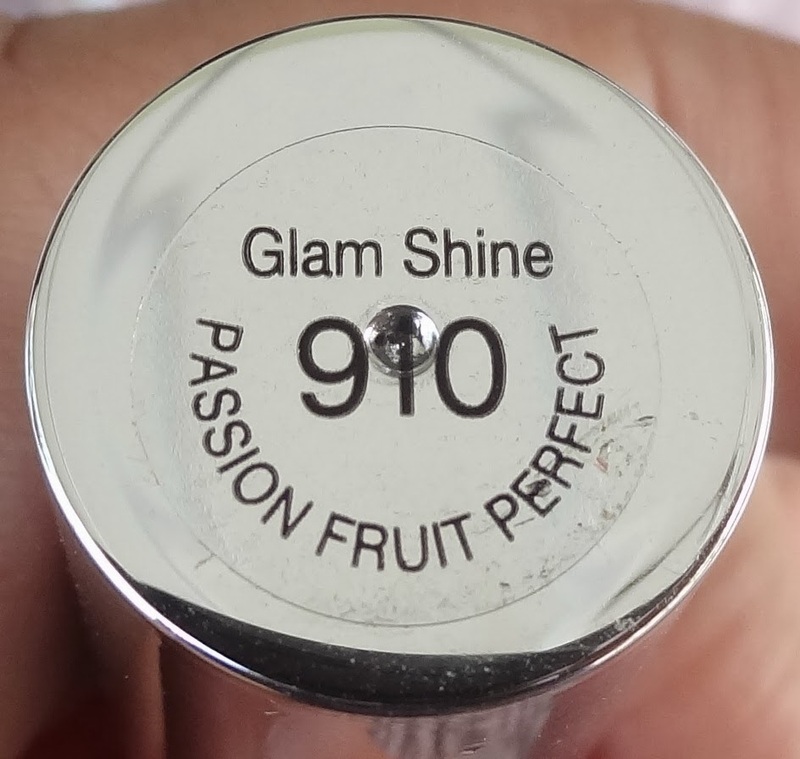 I would have liked it if they would have placed a tiny sticker on the bottom with the name of the shade. Quantity wise I think these are probably the smallest bottles I have seen. The brush is quite flat and big when you compare it to most brushes that I have seen from Lakme, Revlon, Inglot, Dior, Etude, etc. Technically it is a good thing coz it covers a larger area at a time but it has its short comings as it is not easy to maneuver it especially on the edges. Makes the entire thing feel kinda cumbersome. 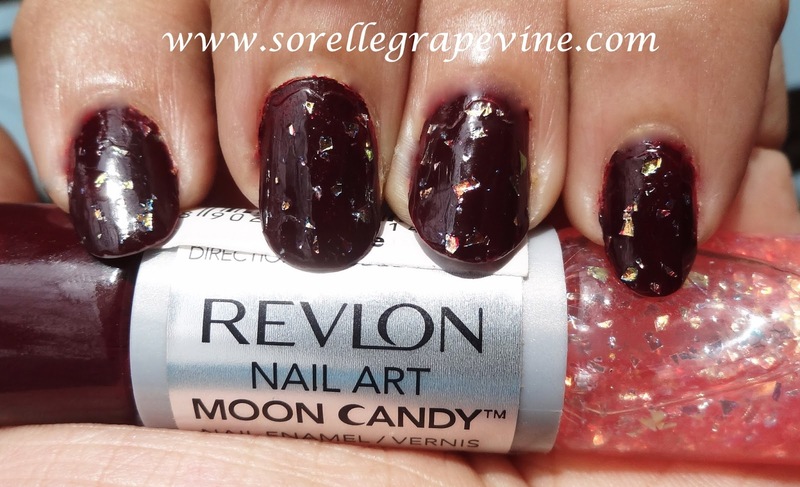 The shade is jet black color filled with lots of round glitter in it. Honestly I was left wondering how does it represent sunset? A flaming sunset?? I might have not traveled the world but I’m sure I have never heard of a black sunset 😛 Being whatever I know but it felt weird to me. Anyways moving on. This is one of the paints from the lot that I had trouble with. It was not a very smooth application trying to get this on and the combination of the texture and the brush made it a painful task for me. See the area where the brush was overlapping while applying, the paint kept stripping off in chunks and gaps. I had to literally dab the brush on my nail like stippling of foundation to get an even finish and to transfer the glitter. They last longer than some of the glitter paints that I have tried. The tips chipped up enough that I have to change the paint by the 3rd-4th day. Now I’m dreading the entire removal process thing. But will try my hand at the whole foil method. I got my paints from Purplle site and I got a little discount on each (around 10 bucks or so). At the counters they are priced at Rs. 235/- for 5 ml of product. It is an interesting shade to have if you don’t mind the drama and they are limited edition. All the paints don’t have similar formulation and some are much better. Done for this review. Did you guys try out this range? What was you favorite color from it? Do get back to me with your thoughts and views. I will be seeing you around – Bye! 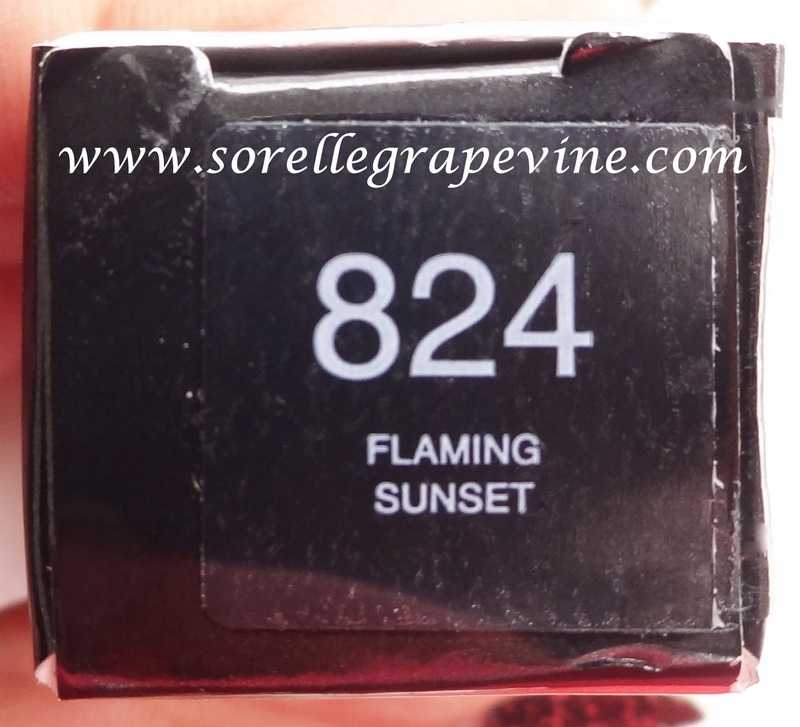 Would you purchase L’Oreal Color Riche Le Vernis Nail Paint 824 Flaming Sunset again? – Even though I like the color no I would not. Plus it is LE.